Fig. 1 Structure of the human Src kinase (UniProt AC: P12931). 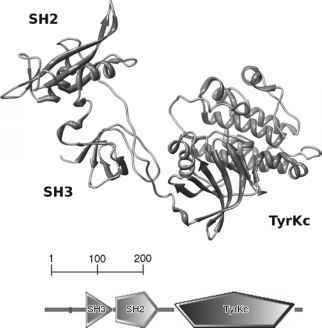 It is easy to notice that the protein is composed of three structurally distinct and loosely associated domains: SH3, SH2 and tyrosine kinase. 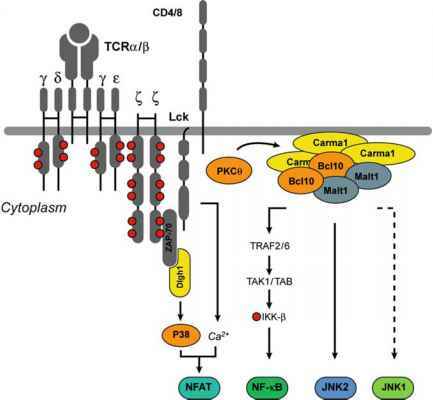 In the lower part of the picture, a schematic representation of the protein highlighting its domain composition is depicted proteins (Liu and Rost 2004). The variety we observe in the proteomes of living organisms was likely generated from a limited set of ancestral domains with different functions. Then, the evolution of protein repertoires may have been driven primarily by three forces: (1) duplication of gene sequences coding for one or more domains; (2) sequence differentiation by mutation and genetic drift, eventually resulting in the acquisition of new functions; (3) gene recombination, which promotes rearrangements in the sequential order of domains (Chothia et al. 2003, Bornberg-Bauer 2005). This interpretation leaves us with a question: how did novel polypeptide domains arise in the beginning? Recently, the observation of species-specific exons in the genomes of closely related species has suggested that the "exonization" of species-specific intron sequences may play an important role in the genesis of domains. Furthermore, insertions and deletions occurring in already existing protein-coding sequences or modifications to the length of sequence repeats may contribute to the process of acquiring new structural features of increased complexity in proteins, ultimately resulting in the creation of new polypeptide domains (Schmidt and Davies 2007).